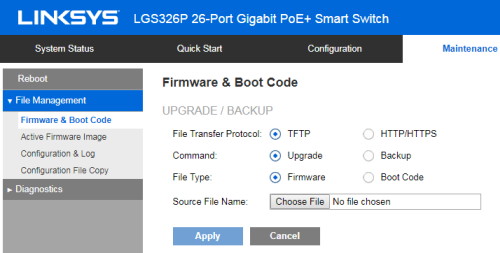 You can upgrade the Linksys Smart Switch’s firmware by HTTP/HTTPS mode or TFTP mode through its web-based setup page. 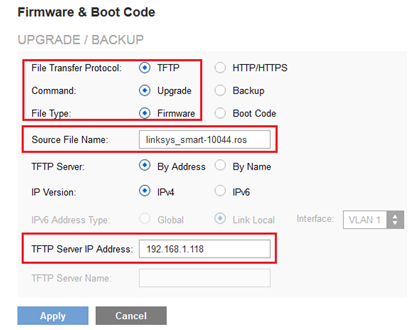 Before upgrading the firmware of your Linksys Smart Switch, you are required to download the firmware first from the Linksys Support Site. Access the smart switch’s web-based setup page. To know how, click here. On the setup page, click the Maintenance tab then select File Management. On the drop-down options, select Firmware & Boot Code. On the Firmware & Boot Code screen, select HTTP/HTTPS. Choose Upgrade for Command and Firmware for File Type. Click Choose File and select the file that you saved from the support site. Then, click Apply to start the upgrade process. When the upgrading process is completed, click on File Management > Active Firmware Image to select the image to be activated after the system reboots. Select Reboot in the left navigation side, then click the Reboot button on the page. On the switch's web-based setup page, click the Maintenance tab. 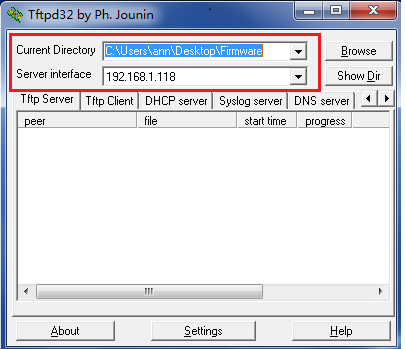 Open Tftpd32 tool on your computer and set it. 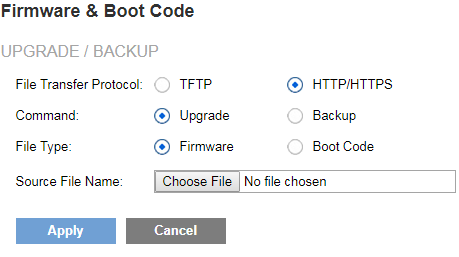 On the web-based setup page, click File Management > Firmware & Boot Code. The firmware upgrade by TFTP mode will proceed.